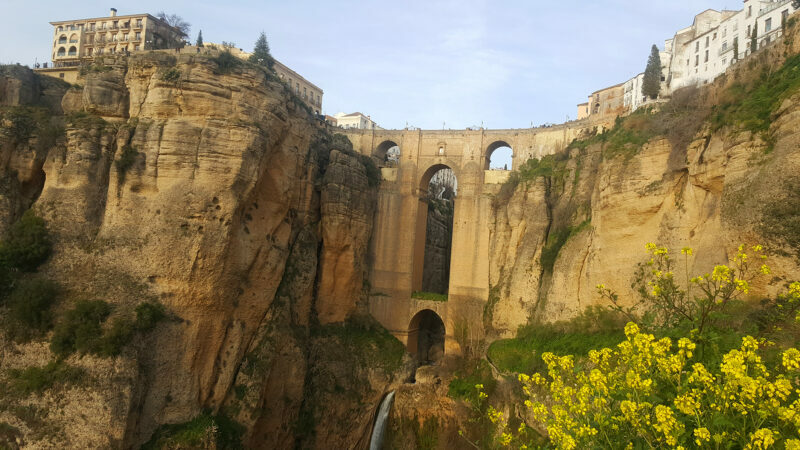 Exploring Spain’s Ronda in one day may not be sufficient but it’s definitely doable! 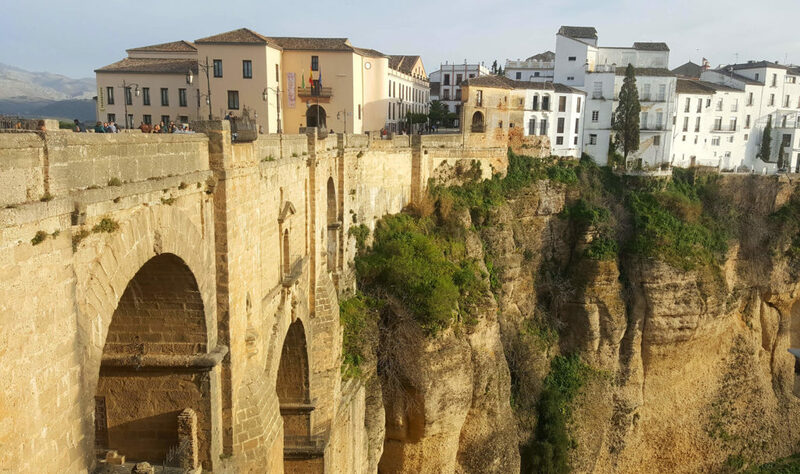 One of Ronda’s biggest attractions are its incredible, breath-taking views, and the good news is that you can’t run away from them. 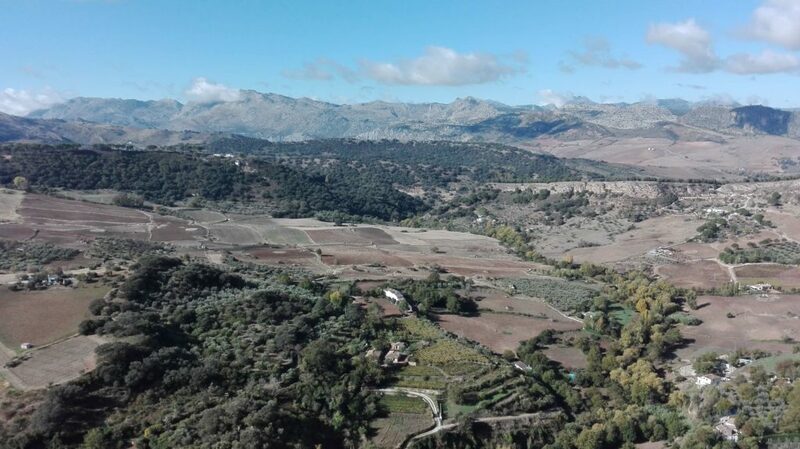 The landscape is all around you and even if you stop in Ronda for an hour, it’s worth it! What can a solo traveller or a romantic couple do in Ronda in one day? Ronda is a small white village located in south-west of Andalusia, Spain, just about 100 kilometres west of the popular Andalusian city of Malaga. It’s mostly famous for its rural atmosphere, crazily beautiful natural surroundings and most of all, its jaw dropping views. 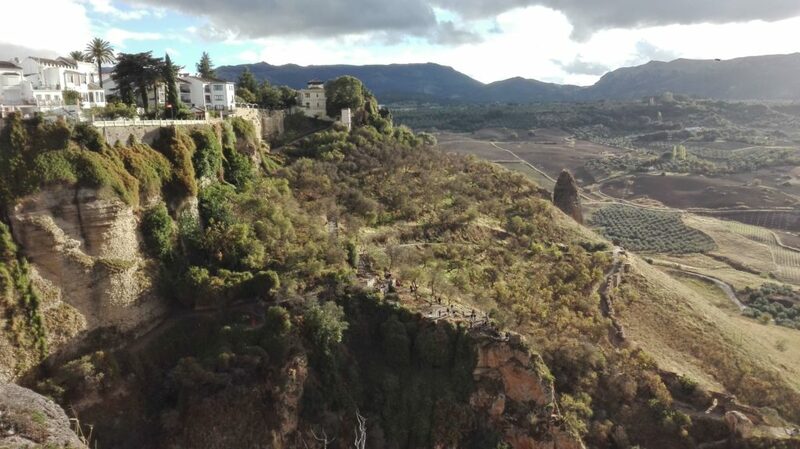 Ronda was built on 750 m above sea level overlooking a gorge in the Sierra de las Nieves National Park. Ronda attracts hundreds of thousands of visitors from around the world and it’s a perfect spot for any kind of traveller. You can easily get around here totally alone, you can enjoy the romantic sunsets with your partner or have fun with a bunch of friends. The question is: Is it possible to explore Ronda in one day? In my humble opinion, it is! Even though there are plenty of places to visit in Ronda, one day is enough to have a memorable experience in this town! I’ve been there twice and both times I stayed overnight. In was always a disappointment to leave but Ronda is such a charismatic place that it takes you only a few minutes to surrender its charm. 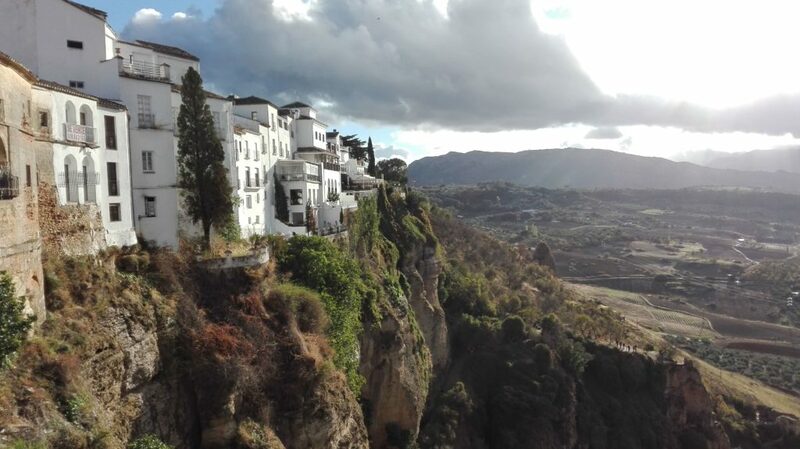 This is probably the most famous and the busiest viewpoint of the white village of Ronda. One of the Ronda’s most popular attractions is located directly next to the Bullring. When you reach the park Alameda del Tajo, turn the left and you’ll get there within a couple of minutes. The Mirador de Ronda can be recognized straight away. Catching the magnificent view of Ronda. Admiring the massive structure of the Puente Nuevo Bridge from below, from the Puento San Migel bridge or El Tajo canyon. You can also explore its ‘secret’ chamber used as a prison, torture chamber and for many other purposes. Small consolation, but at least the prisoners could enjoy their last days of life looking out at the stunning landscape. Puente Nuevo Bridge in Spring. View from Mirador Puente Nuevo. You may have already noticed that Ronda is packed with plenty of viewpoints. It’s fair enough, since the views are the stars of the show in this fantastic village. 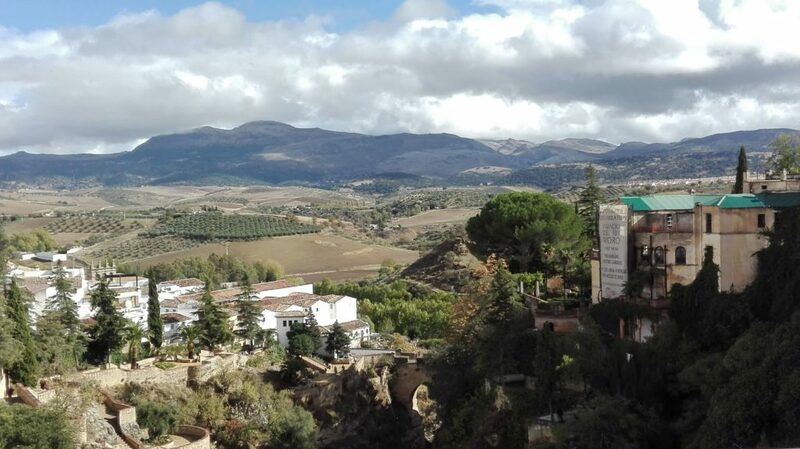 Mirador de Aldehudela is located next to Palacio de Congresos and offers sweeping views of the El Tajo Canyon, the Jardines de Cuenca, and both old bridges Puente Viejo and Puente San Miguel. 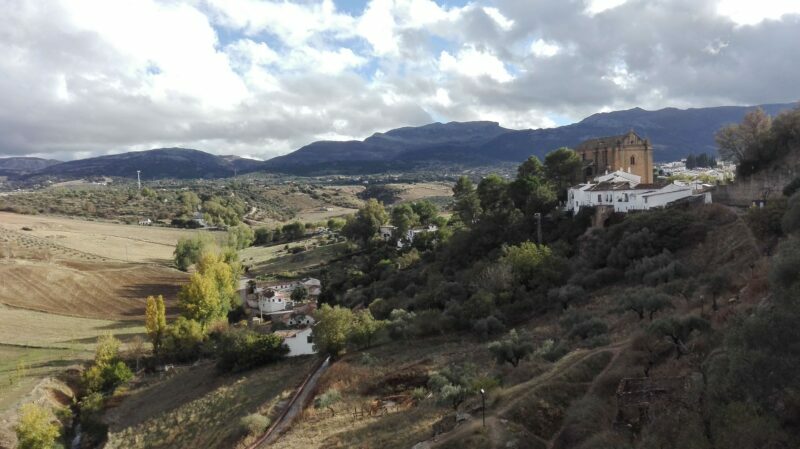 It’s the El Tajo gorge which gives Ronda its unique location, gorgeous views and the typical rural vibe. One special point of interest about this gorge is that its depth is almost double its width! The widest part of El Tajo measures just 68 metres, while the deepest point goes down to 120 metres! All thanks to the Guadalevín River, as mountain streams travelling from the peaks of Sierra de las Nieves created El Tajo’s unique terrain. If you want to get some incredible views of the Puente Nuevo and El Tajogorge , you have to go down. Cross the Puente Nuevo bridge towards the old town and take the first street on right to Calle Tenorio. Carry on straight ahead to reach a small square Plaza de Maria Auxiliadora. There you’ll see a small zigzagging path down the gorge. Wear proper shoes, the pathway is slippery and some parts are surprisingly dangerous. The first stop down the El Tajo gorge is Mirador Puente Nuevo de Ronda. The last time we visited there was a no entry sign saying: ‘Dangerous Path. Real risk of death’. Despite this there was about a dozen of people taking pictures at the edge of the cliff. I definitely believed there might be a real risk of death but I had to take my pics too! It’s a truly stunning spot, impelling you to pop in and get amazed by the views but it really doesn’t look safe. Less danger is waiting for you a bit lower, at Mirador el Viento, or even lower, at Arco del Cristo, Arco Arábe. 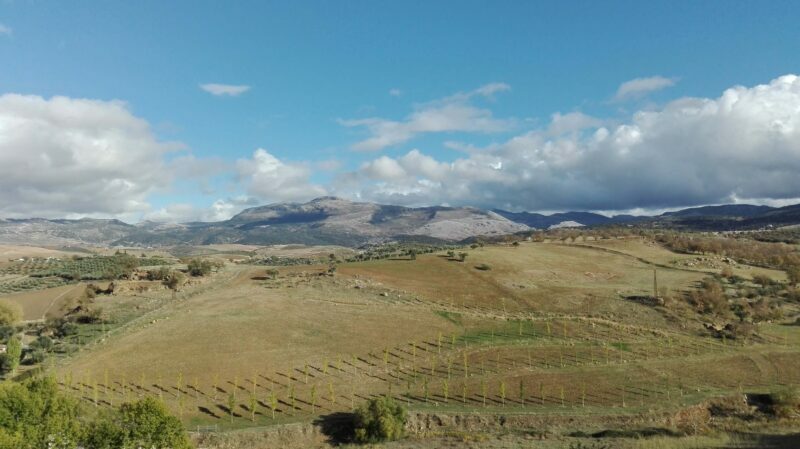 The lowest view point is called Ronda Bridge View Point and it’s directly next to the olive tree fields. Ronda has become a touristic spot which is absolutely obvious when considering all the town’s attractions. One of the places I found less busy without losing any of Ronda’s charms were at the Murallas de Ronda. The history of Andalusian Ronda is deeply influenced by the Islamic caliphate. Arabs invaded Ronda in the 8th century and named the place Hisn Ar-Rundah (‘Castle of Rundah’). Murallas de Ronda, Puerta de Almocábar and Arabic Baths are some of the most important remains of Ronda’s Islamic background. To get there follow the main Puente Nuevo’s street Calle Armiñán. Right before the Museo Cinegatico de Ronda turn right to Calle Alfuenérez Ramón Gómez de las Cortinas. Cross the narrow street, pass the Hotel Monasterio del Carmen and you’ll see a few old steps reaching the Murallas de Ronda. You can turn right to quickly check the Murallas de la Cijara to get a lovely landscape view. Then I suggest turning left, carrying on walking through the Arabic Walls of Ronda. In a few minutes you’ll reach Puerta de la Cijara and later on La Ermita de San Miguel with Puente San Miguel and Puente Viejo nearby. This is the second oldest bridge whose fame was stolen in the 18th century by its newer & significantly more handsome brother, Puente Nuevo. You can catch more countryside views here. If you decide to skip the Walls of Ronda (but you shouldn’t) , you can get to Puente Viejo via a shortcut. At Calle Armiňán take the first street on the left and walk down the narrow Calle Cuesta di Santo Domingo. At the end of the street you will be able to see the Palacio del Marqués de Salvatierra. Walk around the palace and follow the narrow stony route. Now you can fully admire the grandeur of the Puente Nuevo Bridge, proudly standing above the gorge and Guadalevín River. The smallest and the oldest bridge of Ronda. It’s located next to the Arab baths. You can get there following the Murrallas de Ronda route or from the Puente Viejo Bridge. You just have to pass the small path under the Palacio del Marqués de Salvatierra. Puente San Miguel offers excellent views to the two newer bridges, white village of Ronda and the country landscape behind. Ronda’s Jardines de Cuenca are a fantastic spot for having a sunny break after a walk around the gorge or passing through the Murallas de Ronda. To get to Jardines de Cuenca you just have to cross the Puente Viejo. The park has several nice sitting spots. There is more sun than shadow so don’t forget your sunglasses and sunblock with you. At the end of the park, there is another view point — Mirador de Cuenca. In my opinion it’s better to go there and take some pictures in the morning or noon. In the afternoon you have a direct sun shining through the Puente Nuevo so the pictures might be too illuminated and the bridge less visible. One can get tired after so many small routes around the picturesque town of Ronda! Luckily, Ronda has an amazing drink which can quench your thirst. Cerveza Artesanal Rondeña is exactly what a tired solo traveller needs! The same named bar is located at Calle Pozo 5, close to the vibrant city centre of Ronda. From there you can give the city centre a quick tour, pop in one of the several tapas bars and get a snack. If you’re still not tired from all the views you’ve seen, get a coffee at Café Don Miguel which is built directly on the edge of the El Tajo cliff. I’m not sure if the coffee is all that good, but the surroundings are stunning! 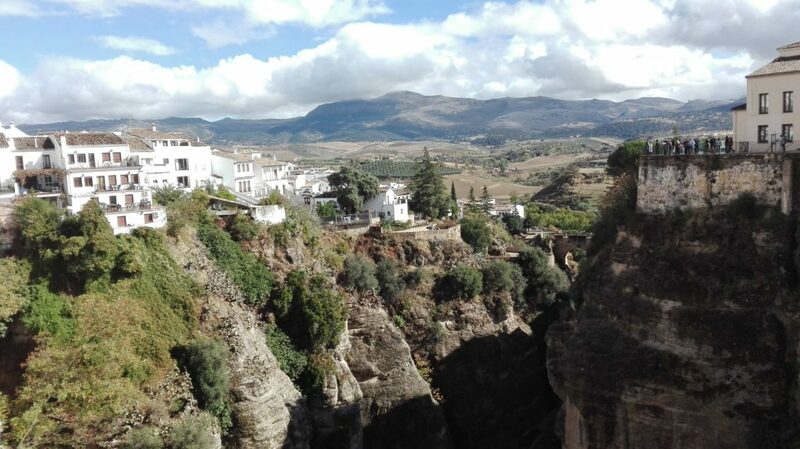 German poet Rainer Maria Rilke finally broke his writer’s block right in the magnificent white village of Ronda when he travelled there in 1912. After poetic inspiration struck in the midst of the scenery of rocky mountains and olive tree valleys, Rilke named Ronda a dream town. I feel the same. I absolutely fell in love with the mystical atmosphere. The views are stunning, always different and never boring. The fascinating scenery catches you straight away. You’re more than happy to stare down the gorge for hours, thinking about how beautiful the Earth is . If Ronda was literature, it would definitely be a romantic poem! Not in the clichéd romantic way, no lovers kisses, sweet tacky words… Maybe those as well, but the way Ronda is romantic is way deeper and more complex. You find love there, love of Earth, love of nature, love of simple things and even love for yourself! This place is perfect for solo travellers, seeking peace, rest and absolute Zen. Whatever place you go in the beautiful white village of Ronda, whichever of Ronda’s attractions you’ll choose, you’ll definitely enjoy your time there. Even though it’s very popular amongst to tourists from around the world, there are always a plenty of quiet spots. Find your Zen world and catch those views.